After 15 years of the Cougar flag on ESPN’s College GameDay, Ol’ Crimson comes home to Pullman. On October 4, 2003, Tom Pounds (’81) bounded out of bed at 6 a.m., well before sunrise. He wanted to arrive early at the set of the pregame television show ESPN College GameDay to get a good spot in the crowd. Pounds and his mother had spent hours handcrafting a giant crimson flag emblazoned with a two-foot-tall Washington State University cougar head symbol. He and his parents, who were visiting from Spokane, had driven 700 miles from his home in Albuquerque, New Mexico, to Austin, Texas, where Pounds planned to wave the flag on College GameDay. In a burnt orange sea of Texas Longhorns fans, Tom Pounds (’81) waves Ol’ Crimson for the first time on Oct. 4, 2003 in Austin, TX. His motivation was simple: to display his school spirit. “There’s a deep sense of joy in being a Coug,” the WSU alumnus explained. Coming to Pullman for the 10/20 football game? Here’s what you need to know about the Cougars’ contest with the Oregon Ducks and the College GameDay program. College GameDay airs on Saturday mornings as a prelude to college football game kickoffs at noon. The show is usually broadcast from a college campus where a pivotal game will be played. Fans holding team flags and signs crowd behind the broadcast set, where they are captured on camera—and can be seen on national television. On that day, the show would feature a game between the Texas Longhorns and Kansas State Wildcats. The Cougs were playing in Pullman, some 2,000 miles from Austin. 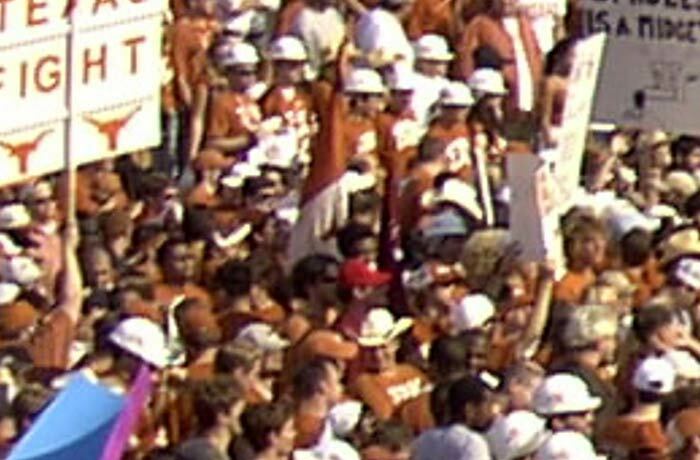 No one paid much attention to the 4-by-6-foot crimson flag sporting a white cougar head. The flag would soon be dubbed “Ol’ Crimson.” By waving it behind the College GameDay set, Pounds unwittingly launched an enduring WSU tradition. Fast-forward 14 years to 2017. The Cougar flag had appeared 199 consecutive times on College GameDay. It is as much a part of the show as the personalities hosting it. October 7, 2017, marked the flag’s 200th consecutive College GameDay appearance. Today ESPN producers seek out the person waving the Cougar flag. They advise when to wave it and where to stand. When the flag is on screen, a graphic shows the current count of its consecutive appearances. “It’s absolutely fantastic that [the tradition] has been kept going for this long,” Pounds said. He had waved the flag himself on College GameDay 8 times by the 200th appearance. Some Cougs have waved it as many as 25 times. Pounds still recalls an episode when host Chris Fowler stepped forward before the show started to scan the crowd. 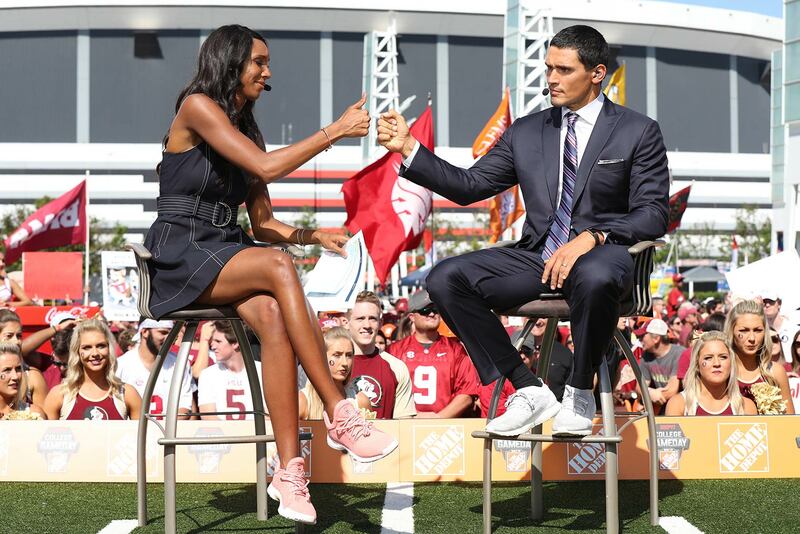 Cougs wave Ol’ Crimson for the 195th time behind Maria Taylor and David Pollack on the set of ESPN College GameDay on Sept. 2, 2017 in Atlanta. “Where’s the WSU flag?” Fowler asked, looking for Ol’ Crimson. “Oh, there it is. I guess we can start the show,” he joked. “We’re an integral part of GameDay now,” Pounds said. 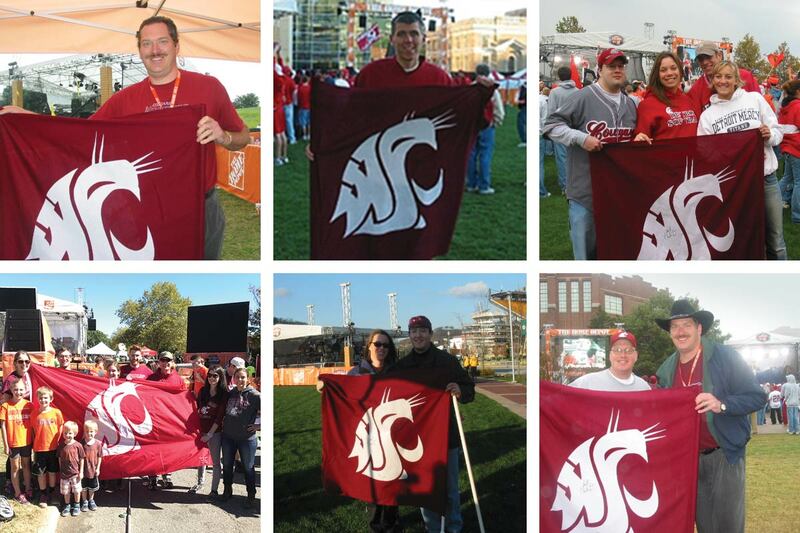 When Pounds first waved the Cougar flag in 2003, he was following a whim. He had planned to drive to Austin to visit his aunt and uncle. The electrical engineer turned teacher figured he would show off his Cougar spirit while he was there. And if he was going to wave a WSU flag on national TV, he was going to make sure it stood out. Two weeks later, Brent Schwartz, a student at Northwestern College in St. Paul, Minnesota, decided that he wanted to wave the WSU flag too. He drove 250 miles to wave the flag during a broadcast in Madison, Wisconsin. That day, the Cougs were playing half a continent away in Palo Alto, California. Schwartz wasn’t even a WSU alumnus. Then John Bley, an alumnus who later founded the Ol’ Crimson Booster Club, convinced his daughter to wave the flag during the next College GameDay broadcast in Bowling Green, Ohio. At first Pounds had a hard time finding Cougs to wave the flag. Now Cougs from all over the country contact Ol’ Crimson manager CJ McCoy (yes, the flag has an official manager) asking if they can help. These dedicated Coug fans—along with McCoy, Bley, Pounds, and other Ol’ Crimson Booster Club members Will Walker and Myk Crawford—transformed the streak into a tradition. The supply of flags has grown, too. It now includes 6 crimson flags, 1 gray flag, and 1 white flag. Only 1 crimson flag and the gray flag are actively in use, while the others are retired. In addition, flag holders sign the current season’s commemorative “traveling flag” after each College GameDay episode. Flags have been formally dedicated to honor members of the community. Among honorees were the late WSU President Elson S. Floyd, McCoy’s mother, and Pounds’ late wife Syndie, who hand-sewed most of the flags herself. In the wake of the 2007 mass shooting at Virginia Tech, a Cougar flag was dedicated to salute the fallen students and faculty members. In 2012 the white flag was retired as a nod to the “No White Flags” movement, which seeks a cure for the neuromuscular disease Amyotrophic Lateral Sclerosis (ALS). The movement was launched by football icon and WSU alumnus Steve Gleason, who suffers from the disease and has become a leading spokesman in the quest for a cure. The Ol’ Crimson Booster Club sold the retired flag for $750 and donated proceeds to the Team Gleason charitable foundation. On October 7, 2017, a brand new flag represented WSU in its 200th consecutive appearance on College GameDay. Pounds and his wife, Mila, unveiled a secret new design in Fort Worth, Texas, on the campus of Texas Christian University. What started out as a display of school pride grew into a campaign to get College GameDay to broadcast from Pullman. A source inside ESPN told Pounds that the show almost came to Pullman in 2015 for the Halloween game against Stanford, which the Cougs lost by 2 points. Instead, College GameDay switched destinations at the last minute, his source said, heading east to Philadelphia for a matchup between Temple and Notre Dame. “People say they’ll never come. I have to chuckle,” Pounds said optimistically in 2017. His optimism paid off this year, as College GameDay finally airs in Pullman for an October 20, 2018, show, followed by a marquee matchup between the No. 25 WSU Cougars and the No. 12 Oregon Ducks in the afternoon. Some may think the Ol’ Crimson tradition is a little crazy. But any Coug will tell you it’s no surprise that alumni and fans across the country picked up Pounds’ idea and ran with it. It’s just another example of unstoppable Cougar pride.